You may or may not know that I teach reformer Pilates at Midtown Pilates here in town a few days a week before and after work. I fell in love with Pilates in January last year and decided to get certified not too long after that. One of the main reasons I love it are the clothes. I LOVE being in comfy clothing as soon as I get home from work each day and on the weekends. Pilates clothing lends itself perfectly to my lounge style. As you know I have started up my #Arnold500miles challenge so I am using my workout gear even more these days and I can use most of my Pilates gear to get outside while walking. My workout style consists of a good pair of crops, soft top, seamless sports bra and if I am walking I of course wear tennis shoes and ankle socks. Most of all comfort is key in every facet of my life. I cannot stand to be uncomfortable in my clothes or shoes! I always look for good studier fabrics that can stand to be washed over and over again and not pill up. Also, pick fabrics that have wicking properties for those hot workouts! 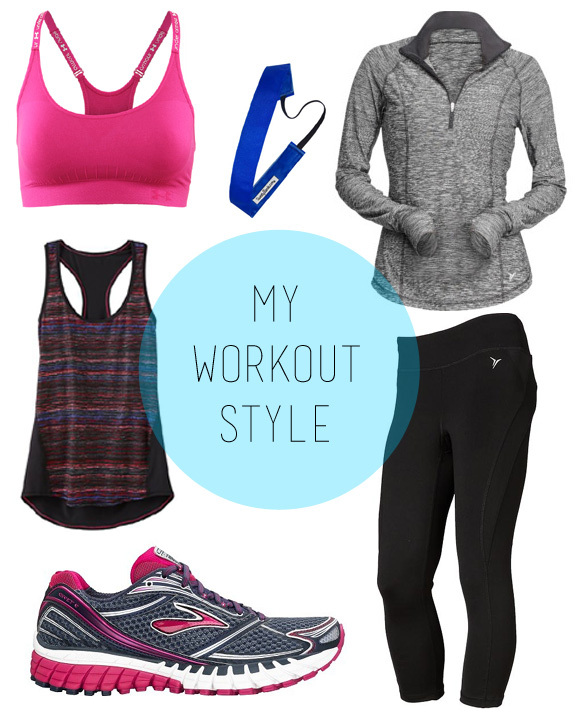 Here are some of my favorite workout pieces that are necessary for my job and my active lifestyle! A good workout outfit must start with a well fitting sports bra like this one from Under Armor. I love it because it is seamless and has no scratchy feeling as I am on top of my head in Pilates class. As you know here in the south it’s warm most of the year so you can find me in tanks similar to this one by Athleta constantly. I love how soft it is and it is also flowy without being billowy which I hate. If it is chilly I will pair my tank with a pop-over like this one from Old Navy. I love it as it has the little thumb holes! My staple workout outfit would not be complete without skinny black crops. I own this pair from Old Navy in every color they make as they fit my body like a glove and are so incredibly comfortable. To finish up I like to lace up these Ghost 6’s by Brooks. I have owned tons of tennis shoes in my lifetime, but none have been more comfortable straight out of the box like these. Worth every penny! Finally sometimes I need to keep stray hairs in place and I use one of these great Sweaty bands to do so. They are so comfortable and versatile as I use mine every night to keep the hair out of my face while removing my makeup! As you can see, most of the items I have listed are quite inexpensive. I shop for most of my workout gear at Old Navy, Target and larger sport stores on the clearance rack of course. There are always sales going on these items so I do not recommend paying full price but instead waiting for a little bit for a better deal! you and me both, girl! I'm in all Lulu Lemon at the moment. That's so cool that you're a Pilates teacher! I love pilates, but I need more cardio than just strength training. Can't wait for my Old Navy pants to arrive!